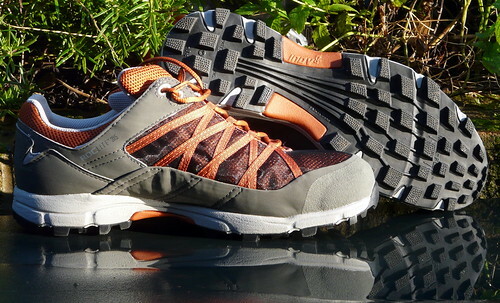 Off-road running round here in the wintertime presents something of a footwear quandry. 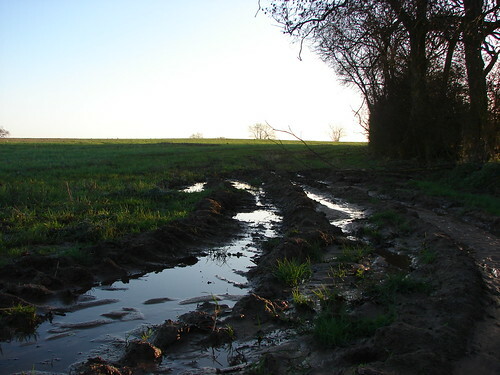 On the one hand, from november to march the countryside is generally submerged in a couple of inches of liquid mud, lying on top of about 2 feet of slightly-less-liquid mud. So you’d think that spikes, or heavily studded shoes, would be the order of the day. On the other hand, it’s rare to be able to string together more than a couple of miles without needing to do some of it on the road, or other paved surface – so spikes are right out, and studs are not much better. So some kind of compromise shoe is required. Over the last 12 months I’ve been alternating between a pair of Saucony Grid Jazz, which are really a road shoe with a slightly grippy sole, and, to be frank, pretty hopeless in the mud, and a pair of Inov8 Mudroc 290s, which are awesomely grippy, but fiercely minimalist, and downright uncomfortable on the road. A niggling hamstring injury has forced me to stop using the 290’s for all but the softest of conditions, since the complete lack of padding seems to aggravate things, so I needed to find a shoe somewhere in between the two. So, when I was contacted by the lovely people at FitnessFootwear.com and asked if I’d like to review a pair of running shoes , it couldn’t have come at a better time. FitnessFootwear have what looks like the complete range of Inov8 trainers & fell-running shoes, plus a pretty good selection of other trail/cross-country trainers, so after a bit of time exploring the options available on their (pleasingly easy-to-use) site, I settled on the RocLite 315s . I ordered them on thursday, and by saturday morning I was unpacking them. First impressions: They come up a little on the large side, and when I first tried them on I was worried that I should have ordered a 1/2 size smaller. I bought my MudRocs a size smaller than my normal trainer size (you need a snug fit for fell running), but these I got in my usual size 10, and there was quite a lot of room in the toe. However, the fit around the heel and midfoot is great, and they felt very secure once laced up, so I decided to give them a try anyway. The heel cup is quite low-profile (though not as low as the Mudrocs, or their Walsh precessors) but I had no problems with heel lift at all. Oh, and I reckon they look pretty nice, too. I took them out on a 10K route with a wide range of (wet!) terrain – a couple of miles of road, an old railway track, parkland, woods, and a bit of farmland. My worries about the sizing were unfounded; in practice my feet didn’t move at all in them and they were very comfortable. I have very wide feet, and I suspect that half a size down might have been a bit tight. The grip was excellent, on a par with the mudrocs on all but the absolute worst of surfaces. On a steep, off-camber section of muddy grass, there was a little bit of slipping and squirming from the forefoot, but other than that it would be hard to tell the difference. 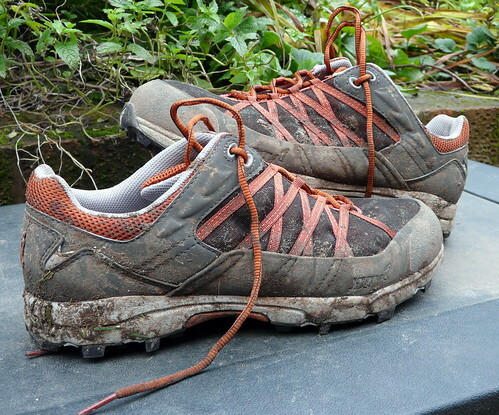 The soles clear well, refusing to clog up even through a ploughed field of clay-ey mud, and on a few reps up an almost-too-steep-to-run grassy hill (the beacon hill in newbold commyn, for any local runners following along!) they didn’t slip once. There’s a little less support under the arch than I prefer (I have quite high arches, so generally end up putting in additional arch supports or insoles) but that should be easily solved. The padding under the heel makes for a comfortable ride on the road, and although there’s a bit less padding under the forefoot than on my sauconys, I don’t think it would be noticeable unless you were running very long distances on the road – it also makes the shoe more stable on uneven surfaces. So, overall I’m delighted with these shoes, and I think these are going to become my off-road trainer of choice for the winter (The Mudrocs will be relegated to the back of the cupboard, to be brought out for races and the twice-annual trip to run on ‘proper hills’). Well, I suppose after having a couple of great races earlier in the season I was about due for a knock back… Race the Train was my big event for the summer – 14 3/4 miles of cross country running, with a good few hills thrown in. Whilst I was never going to be near the top 10 on this one, beating the train (which generally takes 1 hour 47 to do the out-and-back journey) looked like it should be achievable. The first half of the race went very well – despite the unsporting ploughed field at 10K, I was putting in steady 6:30 -7 minute miles, and feeling fine. There are a couple of sharp hills once you turn and head back which slowed things down a bit, but I was still making good progress through the field, overtaking more than I was being overtaken. Then I got to about 12.5 miles, and hit the wall. Without any warning at all, my feet started to feel as if they’d been velcro-ed to the ground. I went from a comfortable 7min/mile trot, to alternating staggering along on the flat and downhills, and walking up the hills; watching as runner after runner passed me, and completely unable to do anything about it. I dragged myself on, finally managing to break into a run with about 3/4 of a mile to go, but having lost a good 5-6 minutes. The train passed me by with about 800 yards to go, but by that time I was past caring, and staggered over the line in just over 1hr 50 mins. Another milestone passed, and another surprisingly pleasing result. This was only the second time I’d ever run a half marathon (the first being a slow-ish trip round the Great North Run about 5 years ago), though I have run longer distances in the past. Anyway, the weather was grim with single-digit temperatures and rain varying from persistent drizzle to outright downpour, but the course held up well, being mostly on sandy forest tracks, and the marshalls were unreasonably cheerful and encouraging. Having taken the best part of a week off in preparation, and spent the last 2 days stuffing myself with cake, I managed to avoid the dreaded ‘wall’ (running out of energy – ususally happens after about an hour or so when the body switches from burning glycogen to burning fat) and kept a quick, but comfortable pace all the way round. Today I ran my first 10K (in fact, almost my first race) for about 5 years. Frankly, it couldn’t have gone much better. When I entered for it a few weeks ago I was hoping for a time about 40 mins; when I started the run today I was thinking that I might just squeeze in in sub-37. In fact I got round in 35:59.98* (how’s that for close-to-the-wire? ), and came in 9th out of a field of ~1200. That’s a P.B. by absolutely miles for me – my fastest 10K previously was about 37:30. Mercifully, the 9am start meant that I was finished before the heat of the day got going, although the folk coming in around the 1 hour mark looked to be suffering from the heat a lot more. It was certainly hard work, but very enjoyable none the less. Next stop, a half-marathon I think. I had considered the Stratford half, but that’s a bit too soon really; I want something in about 6 weeks or so. And if that goes OK, I really fancy a crack at Race the train – 15 miles of hilly welsh trail running some time in mid-august. * according to my stopwatch. My ‘gun time’ was 36:05, but it took me a few seconds to get over the start line. Track session #3, and, although yesterday I was just as knackered as ever, this morning I can actually walk! It's a miracle! Either I'm getting fitter, or I'm getting lazier…must get myself a stopwatch so I can find out which it is. It was an evil session, too (600–400-200–200-400–600-600–400-200 with 100m walk between each set). For once I was the quickest runner in the group, so didn't have anyone either to control my tendancy to do the first 2 sets at an unsustainable pace, or to pace/goad me when I started to flag towards the end. Which might explain why I've not damaged myself as much as usual I suppose. Another track session last night, another morning feeling like my legs have been run over by an HGV. This had better be doing me some good, else I'm going to be disappointed. I still don't understand why it's so hard. I mean, 12*300m ? 300m is nothing ; how can it possibly be hard work? The whole session is barely more than 2.5 miles, but by the end of it I could barely stand up. Riding home was distinctly wobbly, Riding in this morning required the use of gears normally reserved for going up the side of the alps (though I was still quicker than the cars up gibbet hill – hahaha). *Actually, I don't entirely hate it (otherwise I'd stay home and watch TV). Though the best part is definitely the bit when you stop. Went running last night with the runnning club. Since I'd had a fairly energetic weekend, I went around with the 'slow pack' – about 8 miles of mixed terrain in about an hour – but even so, my legs are sore this morning! The best thing, for me, about running with the club rather than on your own, is that I get to learn routes that have evolved over years to be ideally suited to running, rather than just plodding round on the road. Last night's was almost all off-road, which is an acheivement in itself around here, and it managed to get all of the uphill out of the way early on, on good tracks and small roads, before dropping back through woods and farmland. Definitely one to do again.